The other day I put up the trailer for Face of 4; the directorial debut of muscian Alexander Azzi, and now thanks to the awesome Tracy George at TAG publicity I have had the chance to see the whole award winning short film (Best Narrative Film Award at the International Film Awards in Encino, CA). The simple concept means it is easy to swiftly get invested in the man's plight, rolling dice is a simple way to generate tension and it is done well here with a series of escalating dice rolls needed. 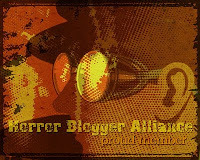 This feels very much inspired by Saw with the escape the trap style concept, for me I also felt a touch of The Twilight Zone in the situation. The minimal lighting draws attention to what is important in the short while also adding to the mystery. I loved how when the man breathes you can see his breath in front of his face, that was a nice touch that added to the sense of location. The tension and suspense was well realised, though I got the impression of where the short would go and so as it progressed the sense of peril reduced for me, though never left entirely. 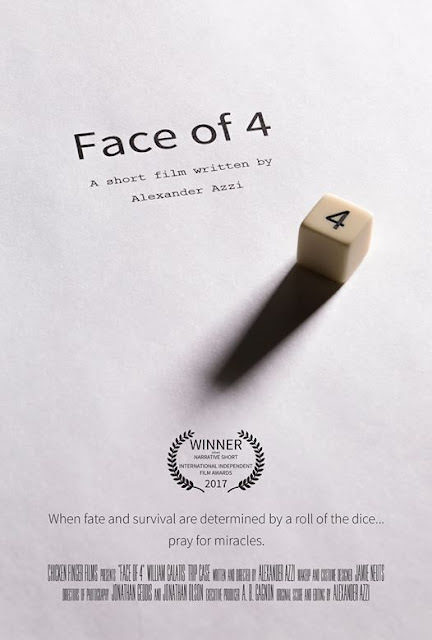 While quite simple in scope I found myself invested enough to enjoy Face of 4, at under fourteen minutes as is often the case with shorts I did not have time to get bored, the progression is concise and focused while the performance is good enough. Face of 4 premiered on Blumhouse last Tuesday.